This has been a hard year with the terrible flooding , typhoons and earthquakes. 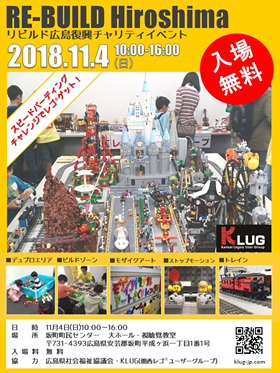 We will be holding a volunteer charity event for the local community in Sakamachi in Hiroshima on the 4th of November. Come and enjoy free displays, play areas, and activities. This entry was posted in KLUG Event by KLUG Admin. Bookmark the permalink.